This is a feature available on the premium subscription plan. 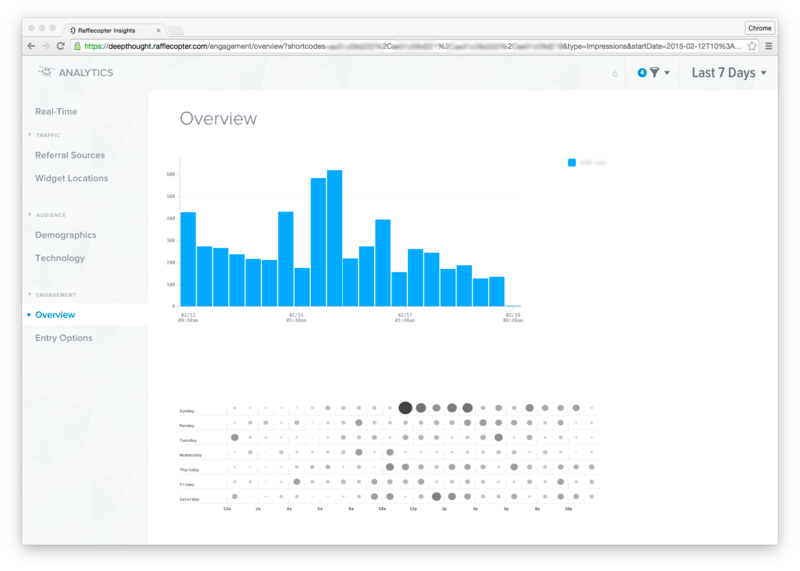 Below, we’ll give you a tour of the new analytics dashboard and the information you’ll be able to access. To access your new analytics dashboard, sign into your Rafflecopter account and navigate to any of your giveaway’s setup, installation, or entries tab. At the top of the page you’ll see a ‘new’ graph icon in your giveaway’s title bar that looks like a bar chart. When you land on your analytics dashboard, you’ll be placed into the real-time analytics page. Here you’ll be able to see entries coming into your giveaways the second they happen. The world map will also show you where entries are coming when they happen. This page serves as the main dashboard page. Referral Sources. See where your giveaway traffic is coming from. 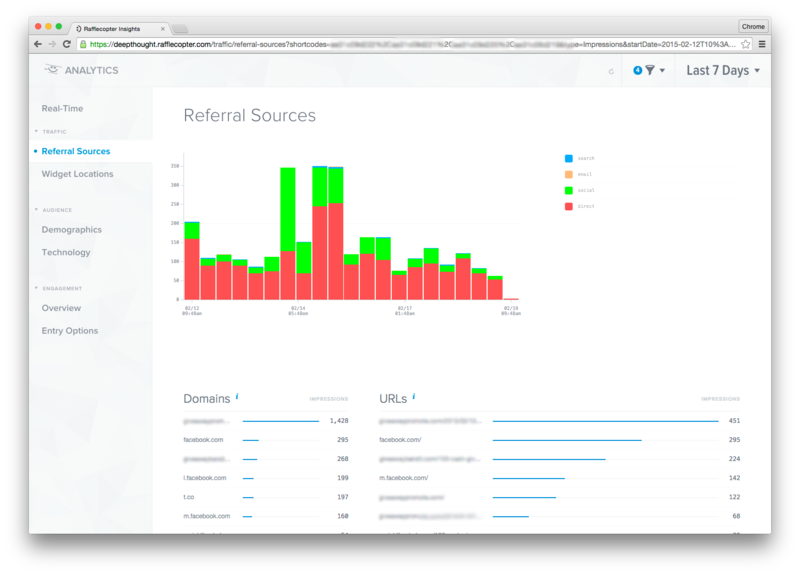 You’ll be able to breakdown your giveaway by the domains & URLs your visitors came from as well as what channels have been driving traffic to your giveaways (direct traffic, social, search, email, etc). Widget Locations. If your giveaways are embedded in multiple locations, you’ll be able to see a breakdown of traffic each widget receives. Demographics. Breakdown your giveaway entrants by their country and state they’ve entered from. Additionally, see the top ten most popular cities entrants are arriving from and top ten languages spoken by your entrants. Technology. Get an overview of your entrant’s devices (desktop vs mobile), popular browsers, and operating systems. Engagement overview. Get a general overview of your giveaway’s entries by time of day, referral sources, widget, locations, and channels. Entry options. See what entry options have been popular in your giveaways. Here you’ll be able to see info behind options that have the most entries, how many entrants have been referred to your giveaway by other entrants, etc. One fantastic aspect of the new analytics dashboard that ties everything together is that you can sort and filter by giveaways and dates at the top right of your analytics dashboard. 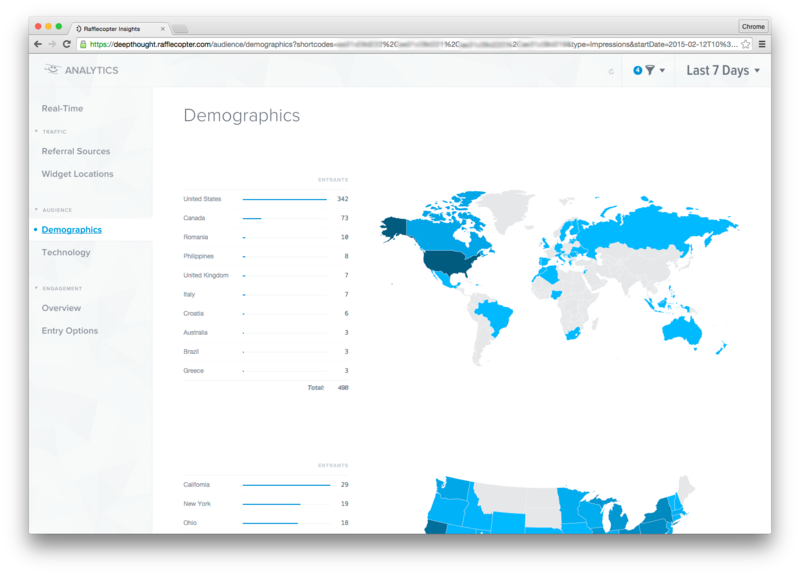 That means you’ll be able to look at the analytics of multiple giveaways in a single view. Select date ranges to compare past giveaways to promotions that are currently running. The expanded analytics are awesome! One suggestion: bring back the at-a-glance view of the number of unique entrants. This was the most valuable feature, in my opinion, of your previous real-time analytics. It is greatly missed. You read our minds… you’ll see an update in the next week or so that will include this (and other improvements as well!). Hey Bridget – we pushed out some updates in the real-time at-a-glance view that shows unique impressions, entries, and entrants. More improvements to come! Excellent, thanks for the update Greg! I don’t have any live giveaways to view an example yet but I’ll check it out this week when I do. Would be helpful to also have end numbers for unique entrants displayed somewhere other than the real-time view (for giveaways that have ended). Love these! I do love Rafflecopter but can’t justify the premium plan’s cost. These will be great features for larger businesses that are doing a big giveaway or do a lot of them though! I hope to be able to afford the premium goodies one day in the future. Hiya Greg as a brand approaching multiple bloggers with a give away incentive, I want to know how easy/or possible it is to have one dashboard that easily tracks multiple campaigns for 20+ bloggers using the widget on their own sites. Hey Hannah — what these analytics will do is let you track how many impressions and entries are received based on where the widget is embedded. So if for example you’re running a giveaway in conjunction with ten bloggers and you wanted to see which of the ten blogs drove the most entries, that would definitely be possible. Let me know if that helps answer your question!